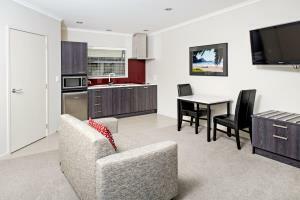 Our Family Apartment has been designed to ensure your stay is as comfortable and relaxing as possible. With two separate bedrooms everyone can have their own space, and the large living area provides plenty of room to get together. Our Easy Access Studios have been designed to meet the needs of those who are mobility impaired. 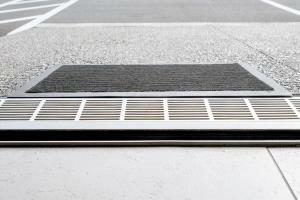 The room is accessible by a gentle ramp, with designated parking right outside your door. King sized bed with space around furniture. Walk in shower with drop down shower seat. 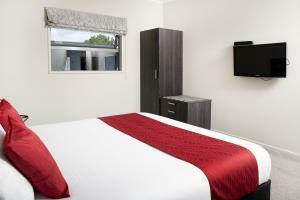 Wheelchair access from the carpark into your room. 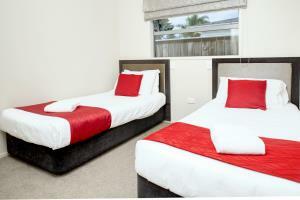 A Twin Studio has all the facilities you need to enjoy a good night's sleep in Whakatane. 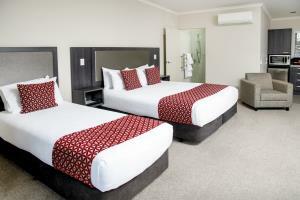 With a king size bed and a separate single bed, there is plenty of space to rest weary heads. 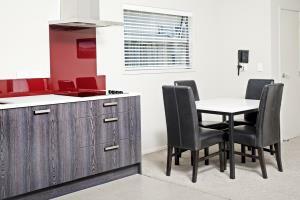 The full kitchen facilities mean you can enjoy a home made meal in the comfort of your own room. 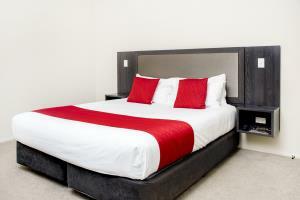 King bed and king single bed. 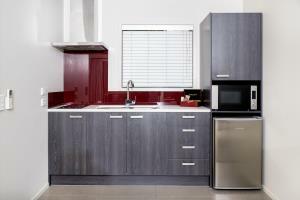 Kitchenette with electric hob and microwave. 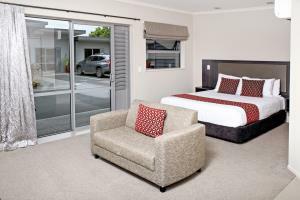 For the corporate traveler or holidaying couple, there is no need look further for your accommodation in Whakatane. 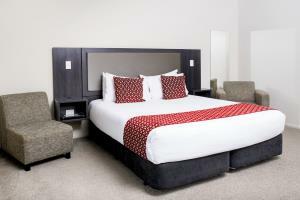 Our Executive Studios have everything you need to relax after a hard day on the road. 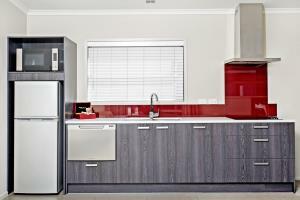 A large unit with space and privacy makes it very popular with our guests. 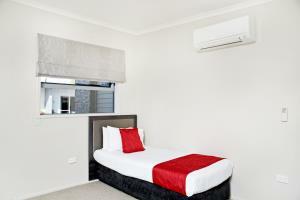 It comprises of a separate bedroom with a king, and a single bed. 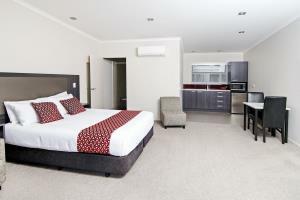 In the lounge there is another single bed that can be converted into either, two singles. 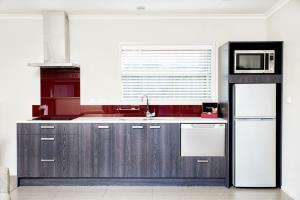 The kitchen is set up with cooking facilities as well as a fridge/freezer and dish drawer. 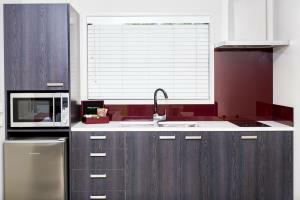 Our Apartments are ideally suited to those who need a bit of extra space and privacy. Step out of the generous main room into the bedroom with a king size bed.The main living area has a full kitchen, including a dishwasher. 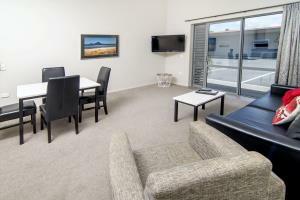 The comfortable sitting area has a 40" LCD TV for you to relax in front of. 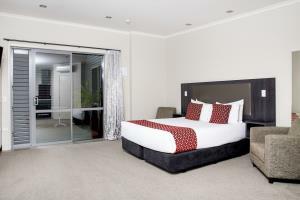 In the lounge there is an additional we king single bed. 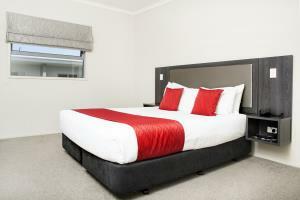 Single bed in the lounge.